This paper was first published (June 2018) on the IDEAS website. This Brief IDEAS recommends that the government utilize the opportunity of the GST abolition and replacement with SST, to implement a new tax system that is transparent and effective, called a Reformed SST. One of the most important promises on which Pakatan Harapan (PH) ran its GE 14 campaign was abolishment of the Goods and Services Tax (GST) that it viewed as a regressive, anti-poor tax (Pakatan Harapan, 2018). PH also promised to re-introduce the Sales and Services Tax (SST), which was replaced by GST in 2015, claiming that SST is fairer to both citizens and businesses. On 1st June 2018, PH fulfilled its first promise practically by reducing the GST to zero-rate. While the government now deliberates on the new SST, which will be levied in September, this Brief Ideas provides some thoughts on its structure thus hopefully making a contribution in an important fiscal policy debate. This paper considers the lessons learned from both the rocky implementation of GST and the imperfect SST that came before it. We recommend that rather than simply bring back the original SST, the government should introduce a new Reformed SST (RSST). We will use the term Reformed SST or RSST in this brief to refer to this proposed framework. The sales tax component of SST was only paid at the initial stage of distribution, whereas GST was paid at every stage in the process. Businesses were able to offset GST paid on inputs against GST received. However, this led to a complex, burdensome and time consuming process for filing refunds. 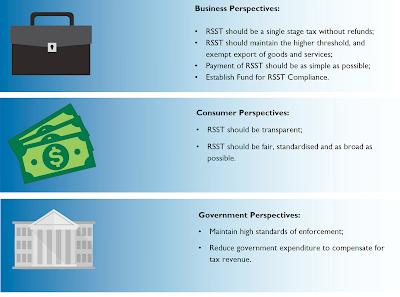 RSST should return to single stage taxation. As a result, businesses will not be required to file any refunds and their payment to the treasury will be considered final liability.This will also increase the working capital which is critical to healthy functioning of all firms, but particularly SMEs, which are often run on private equity. The government will need to consider how to avoid tax being paid on inputs in this scenario and should consult closely with industry on how best to do this. Under SST, raw material and other inputs could be purchased tax free by licensed manufacturers, but the process of acquiring these licenses was burdensome and bureaucratic - so this will need to be simplified. Under the previous SST regime, businesses were required to charge Sales Tax if their annual sales turnover exceeded RM100,000. When GST was introduced, the threshold increased to a minimum of RM500,000 of taxable return per annum or higher. When the threshold level increases, the marginal benefit from the collection of tax revenue will increase significantly. We recommend maintaining the minimum threshold of taxable return of RM500,000 for the RSST, to ease the burden on small businesses, and maximize the marginal benefit. The government should also maintain the current practice from the GST regime of exempting the export of goods and services from the RSST, to encourage development of Malaysia’s export sectors. According to the World Bank (2018) Ease of Doing Business report, Malaysia was ranked at number 73 in terms of paying taxes. Under the chapter of paying taxes, it records the taxes and mandatory contributions that a company must pay or withhold in a given year, as well as measuring the administrative burden in paying taxes. The rank is significantly lower than the 24th overall rank in the Ease of Doing Business that Malaysia enjoys. This indicates that there is a wide margin by which the Malaysian government can improve the country’s ranking on ease of paying taxes by utilizing this opportunity of introducing a new tax. The new SST should be business friendly by having standardised and simplified administration procedures, and incorporating GST best practices. For instance, the modes of payment for SST should remain online, and the web-page needs to be user- friendly with explicit instructions. In addition, the time that businesses take to pay the tax needs to be revised. The government should ensure that businesses are encouraged to pay taxes promptly, with appropriate measures and incentives. The government established a fund to compensate for the costs associated with the introduction of GST, and a similar fund should be attached to the implementation of RSST. The government’s decision not to have GST will create extra disturbance for businesses and conversion to the new RSST platform will entail additional costs for businesses. We recommend an allocation of RM100 million for all SMEs, to cover the cost of installing software and imparting necessary training. A criticism of the previous SST regime was that the sales tax component of the final price paid for goods was not know to the consumer. GST improved the transparency of pricing as businesses were required by law to state the amount of GST charged in any given receipt. Under RSST, we recommend that the government maintain the same level of transparency as the GST regime by requiring businesses to state the amount of sales tax paid for a given product in the final receipt.This will require this information to be passed from the manufacturer along the supply chain to the retailer so that they can provide the information to the consumer. Unlike GST, the amount will not change at each stage. Businesses should not be required to report all their costs, or how much profit they are making, but since the sales tax is intended to be passed to the consumer it is reasonable to require that the exact amount is made know to them.This requirement for transparency will also support the government in enforcing fair practice among businesses once the new tax is introduced. When the GST was introduced it replaced the multiple rates of the SST with a flat rate of 6%. In order to reduce complexity and variability in prices we recommend that RSST should also adopt a standard rate for both the sales tax and service tax elements, and for different products.The government will need to consider carefully how to set the rate. Even if the rate for RSST is set at 6% or higher the amount is likely to be lower than under GST, as the tax is only applied at the initial stage. We propose an initial rate of 5%. We also recommend that RSST maintain the exemptions of the GST regime, including the 30 plus items that were zero-rated. The coverage of taxable goods and services should also remain as it is under the GST regime. A criticism of the SST was that sales and services taxes could “cascade” such that the consumer was paying a higher effective tax rate. This could occur when a consumer purchased a taxable good as part of taxable service, such as buying a soft drink in a hotel bar. In order to avoid this situation, we suggest that the government could require service providers to deduct the sales tax paid from the value of the bill before calculating the service tax. This should be possible, if the earlier recommendation of requiring that business state the amount of sales tax paid is adopted. Under SST, businesses were only required to acquire a license if they reached the RM100,000 threshold. Under the RSST, we recommend that businesses be required to register under Royal Malaysian Customs if they meet the proposed RM500,000 threshold, not just acquire a licence, as is the regular practice under GST. Registration of businesses will increase the transparency of the tax system and will enable customs officials to more easily identify businesses that are trying to escape from paying the new taxes. Frequent reporting, record-keeping, and invoicing based on the practices introduced during the GST regime are highly recommended. Returns should be filed not later than the last day of the month after the end of every two months. These practices will discipline the businesses to be accountable and professional in money making and paying taxes thoroughly. Since the government is expected to collect less revenue with the abolishment of GST, the federal government needs to exercise greater fiscal discipline. Prime Minister Tun Dr. Mahathir’s decision to abolish some of the departments in the Prime Minister’s Office (PMO) unit such as Land Public Transport Commission (SPAD) and Jabatan Hal Ehwal Khas (JASA) is a commendable move. The previous government has allocated RM17.43 billion for the PMO itself. Some of the bodies under PMO has a redundant role with existing ministries, such as SPAD and the Ministry of Transport, Perumahan 1 Malaysia (PR1MA) and Ministry of Housing and Local Government, and many more. Therefore, by reducing the budget allocated to PMO and restructuring some of these units into relevant ministries, the government may cut its expenditure and reduce fiscal deficits. The government should use this opportunity to improve compliance, simplification and equity in Malaysia’s tax structure. Education of tax payers is critical to manage their expectations, as historical data is not supportive of the popular claim that GST caused price hikes. Businesses should support the new government measures by cooperating and adopting the new tax structure. 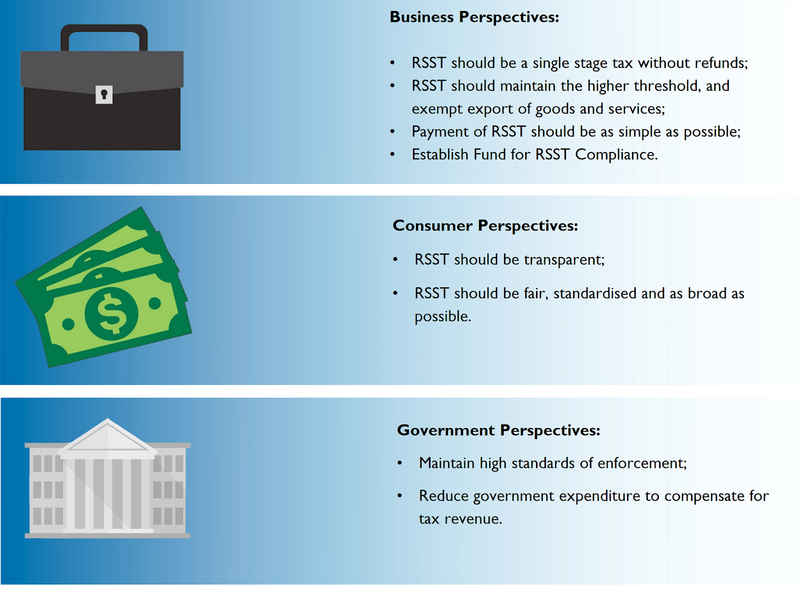 RSST should be structured like a reformed tax and has to be made to look like one. Licensed manufacturers entitled to deduction of sales tax paid on inputs. No deduction or recovery of input tax for services. 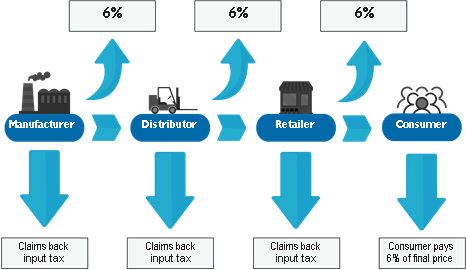 Simplified process for manufacturers to deduct sales tax on inputs. No deduction or recovery of input tax for services. Required to issue invoices with detailed requirements as to the information the invoice must include. Required to issue an invoice but no detailed requirements as to the information the invoice must include. Must account for Malaysian GST in a return no later than the last day of the month following the end of his taxable period. Required to file a service tax return or sales tax return within 28 days after the end of each two-month taxable period. Required to file a tax return not later than last day of the month after the end of each two month period. Department of Statistics Malaysia. (n.d.). Ministry of Finance Malaysia. (n.d.). Pakatan Harapan. (2018). Buku Harapan: Rebuilding our nation fulfilling our hopes. Pakatan Harapan. World Bank. (2018). Doing Business 2018: Reforming to create jobs. World Bank Group. This paper has been reviewed by Raja Kumaran, Executive Director of Indirect Tax Advisory Group (ITAG) at PWC. Adli Amirullah is a researcher under the economics and business unit at IDEAS Research and Publications Division. He received his Bachelor’s Degree in Economics from the International Islamic University Malaysia (IIUM). He was a Royal Education Award recipient for 33rd IIUM Convocation who has shown outstanding performance in academic and co-curricular activities. Ali Salman is Chief Executive Officer at IDEAS. An economist and public policy expert, he is author of more than thirty independent studies, reports and monographs on wide range of topics including regional trade, public finance, competition policy, innovation, and youth policy. IDEAS is inspired by the vision of Tunku Abdul Rahman Putra al-Haj, the first Prime Minister of Malaysia. As a cross-partisan think tank, we work across the political spectrum to improve the level of understanding and acceptance of public policies based on the principles of rule of law, limited government, free markets and free individuals. On 2 September 2016, IDEAS was ranked as the 17th think tank to watch globally in a survey of more than 6,800 think tanks in 143 countries by the University of Pennsylvania’s 2015 Global Go To Think Tank Index Report. Please support us by making a donation.You can make a contribution by cheque payable to “IDEAS Policy Research Berhad” or by transfer to our account CIMB 8008852042. We can only survive with your support. Based on analysis by Schofield (2015).